Godavari Pushkaralu starts on Tuesday 14 July and ends on Saturday 25 July in 2015. The river for each year festival is based on the presence of Jupiter on which Zodiac sign by that time. Pushkaram is an Indian festival dedicated to worshiping of rivers. Godavari Pushkaralu will celebrate for twelve days. It is also known as Pushkaralu (in Telugu), Pushkara or Pushkar. Pushkaralu celebrated at shrines along the banks of 12 major sacred rivers in India. The best Place to visit at Godavari Pushkarams is Narasapuram, Kovvur and Rajahmundry in Andhra Pradesh. In Telangana state Dharmapuri, Karimnagar, Kaleshwaram and Bhadrachalam. At the time of Pushkararalu pushkar ghats will be build for people convenience. The significance of Pushkaralu is to give pradosha to the ancients. Pushkaralu believed as that taking a sacred bath in the rivers, when Pushkar is present, will wipe off all their sins. So, people look for Pushkaralu time to have a sacred bath. A total of 67 pushkar ghats constructed along the river in the five districts in Telangana state. Most of the ghats will be in Adilabad. As Jupiter travels from one zodiac to another months will change and as well pushkaralu occurs. Godavari Pushkaralu occurs when the zodiac sign enters into the Leo. Godavari river starts from Nasik trayambakam (Lord Shiva jyothirlingam presents) and enters at Basara (Goddess Saswathi temple)of Adilabad in Telangana State and travel through Karimnagar, Khammam, Nijamabad and Warangal. In Andhra Pradesh West Godavari and East Godavari. 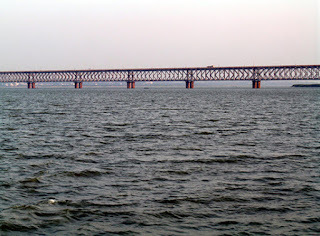 Godavari also called as Dakshin Ganga, Dakshin Gangothri, Vrudha Ganga and Indian Rhine river.